Springpool fishery is a commercial fishery. A tranquil haven in the heart of Cheshire's rural country side, two beautiful mature waters in idyllic surroundings with a superb stock of fish. The fishery consists of two ponds, Spring Pool and New Pool. 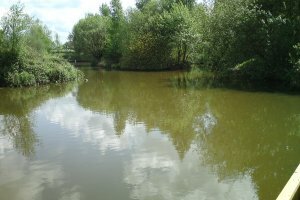 They are both well established ponds with a variety of fish from Golden Tench to Catfish. Cruican Carp, Mirror Carp and Common Carp up to 25lb, some nice grass carp, and an abundance of catfish three over the 30lb mark a number of twenty's and upper doubles. how close is the access to the pool for disabled anglers please? Hello. Im thinking about fishing your lakes this year, could you please tell me what the access is yto the fishery and then to the swims.I suffer badly with a bad back at times so have to keep things light and as close to the swims as its possible to get? Thanks Dave.